BACKGROUND: HIV-associated tuberculosis (TB) is common in South Africa. The optimal time for initiating antiretroviral therapy (ART) in co-infected patients is a clinical challenge. AIM: We aimed to compare clinical outcomes of patients with HIV-associated TB who commenced ART at different stages of TB therapy. METHODS: A retrospective chart review was conducted of 458 patients who initiated ART at <28 days (immediate), 29 - 56 days (early) and >57 days (delayed) after commencing TB therapy, and clinical outcomes after 6 months of ART were compared. RESULTS: There was a higher mortality in the immediate group, although this was not significant. Renal impairment (hazard ratio (HR) 2.5; 95% confidence interval (CI) 1.3 - 4.9; p=0.004) and inpatient ART initiation (HR 3.7; 95% CI 1.6 - 8.2; p=0.001) were risk factors for HIV-associated TB mortality. A baseline haemoglobin concentration >10 g/dl (HR 0.2; 95% CI 0.1 - 0.6; p=0.003), extrapulmonary as opposed to pulmonary TB (PTB) (HR 0.3; 95% CI 0.1 - 0.7; p=0.005) and extrapulmonary plus PTB as opposed to PTB (HR 0.3, 95% CI 0.1 - 0.6; p=0.002) were significantly associated with decreased mortality. CONCLUSION: The timing of initiation of ART after commencing TB therapy was not significantly associated with increased mortality or survival. Patients with more advanced disease were more likely to die. Early HIV testing and ART initiation is recommended to decrease mortality. Tuberculosis (TB) is the leading cause of mortality in people living with HIV infection (PLHIV),1 with almost 1 in 4 deaths attributed to HIV-associated TB.1 A crucial question in caring for patients who are co-infected has been the timing of initiation of antiretroviral therapy (ART) after commencing TB therapy.2 This is particularly pertinent in South Africa, a country with a high HIV-associated disease burden. Many problems are associated with initiation of ART shortly after commencement of TB therapy, including drug interactions, overlapping toxicities, development of the immune reconstitution syndrome (IRIS), and poor adherence to therapy due to a high pill burden.2,3 These complications must be balanced against the high mortality in PLHIV co-infected with TB and the need to reconstitute their immune systems. As the outcomes of the above studies are not consistent, it was hoped that this study would contribute to the understanding of when to initiate ART in HIV-associated TB. We aimed to describe some baseline demographic variables of adults with HIV-associated TB accessing ART in an urban hospital in KwaZulu-Natal (KZN), and to compare outcomes including mortality, hospital admissions, development of TB IRIS, adverse drug reactions and immune reconstitution based on the duration of TB therapy received before commencement of ART. An observational analytic retrospective cohort study using medical records was conducted at McCord Hospital, a state-subsidised hospital with a wide geographical catchment area serving mostly lower- to middle-income, medically uninsured people in Durban. The HIV programme includes an outpatient HIV clinic and an inpatient ART initiation programme. From 2008 to 2010, an average of 1 364 patients per year were initiated on ART. Inpatients diagnosed with and started on TB therapy for HIV-associated TB and who consented were initiated on ART as inpatients, many of them within 2 weeks of commencing TB therapy regardless of their CD4 count. All adult PLHIV (18 years or older) already on TB therapy at the time of ART initiation from 1 January 2008 onwards were enrolled, as long as they received at least part of their TB therapy at the hospital. Data were collected for 458 patients who initiated ART between January 2008 and November 2010. Participants with HIV-associated TB were categorised into those who initiated ART at <28 days (immediate), 29 - 56 days (early) and >57 days (delayed) after commencing TB therapy. With 95% confidence and 80% power, a sample size of 420 (280 in the immediate group and 70 in each of the other groups) was determined by a statistician. A larger sample was required in the immediate ART group because of their expected increased morbidity and higher mortality. The sample size was increased to 450 to compensate for loss to follow-up and to have sufficient power for multivariable analysis. Patients were enrolled consecutively until the required number for each group was achieved. The actual number of patients in each group was 303 in the immediate, 85 in the early and 70 in the delayed ART group. Misallocation of participants between groups was corrected to ensure that each group comprised the minimum required number. Data obtained from the electronic patient record were recorded on a standardised data collection tool, and missing information was obtained from the paper-based patient records. Baseline demographic data and health status variables included age, gender, BMI, previous history of TB, other opportunistic infections (OIs), timing of initiating ART, CD4+ count, haemoglobin (Hb) concentration, urea, glomerular filtration rate (GFR) and history of using traditional medication. The current episode of TB was categorised as 'definite' TB (bacteriological diagnosis) or 'probable' TB (symptoms plus suggestive imaging or biochemical findings); presence of PTB and EPTB as well as the type of EPTB were also recorded.9 The TB therapeutic regimen at ART initiation was recorded and a record of TB drug sensitivities was included if available. The follow-up period was to completion of 6 months of ART. Follow-up data included CD4+ count and viral load (VL) measurements at 6 months, weight at 1, 2, 3 and 6 months on ART, TB and ART adverse drug events, clinician-documented concern over adherence, and use of traditional medication during ART. The outcomes recorded were episodes of IRIS (defined as a paradoxical worsening of TB after initiating ART based on definitions of a group of specialists in the field10), hospital admissions, mortality, and time to death after initiation of ART. SPSS version 18 was used to analyse the data. A p-value <0.05 was considered statistically significant. Demographic variables were compared between the three ART groups using ANOVA in the case of continuous variables, and Pearson's chi-square test for categorical variables. Bivariate analysis entailed assessing the association (incidence risk) between each of the ART groups and the outcomes of interest as well as Kaplan-Meier analysis for the outcomes where time-to-event data were available. To control for confounding, multivariable analysis using Cox proportional hazards models for time-to-event outcomes was calculated using Stata version 11. The McCord Hospital Research Ethics Committee and the University of KwaZulu-Natal Biomedical Research and Ethics Committee (BE205/010) provided ethical approval for the study. 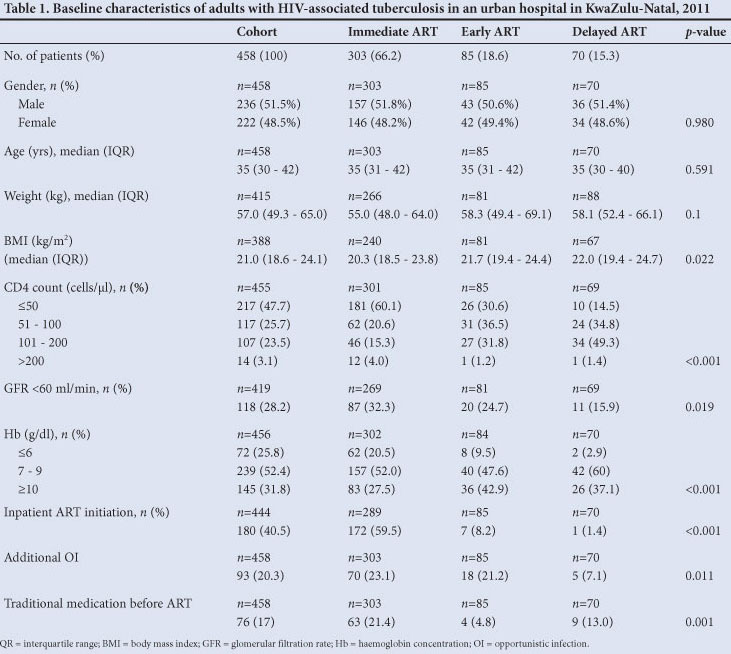 The demographic and most health-related variables obtained did not differ significantly between the groups who had immediate, early or delayed ART initiation in participants with HIV-associated TB on therapy (Table 1). The BMI differed significantly between the groups, but this is not supported by the actual numbers and percentages, indicating that it could be a type 1 error. The group in which ART had been initiated immediately also had significantly lower CD4+ counts, GFRs and Hb concentrations and a significantly higher chance of having other OIs, using traditional medication prior to ART, and initiating ART as an inpatient. There was no difference in the distribution of previous TB between the groups. Those in the immediate ART group were statistically more likely to have probable TB (63%) as opposed to definite TB (37%, p=0.001). The immediate ART group also had significantly more cases of PTB plus EPTB (31%) compared with the early (20%) and delayed ART (13%) groups (p=0.001). TB drug susceptibility did not differ significantly between the groups (p=0.098). The cohort as a whole increased in weight and achieved increases in CD4 count and viral suppression despite healthcare providers documenting concern over adherence in 54 patients, and there were no significant differences between the groups. Few patients reported using traditional medication during ART. TB therapy-induced hepatitis occurred in 13 (2.9%) of the cohort. There was no association between ART group and TB therapy-induced hepatitis. One TB therapy-related skin reaction and one isoniazid-related red cell aplasia occurred. No participant developed ART-induced hepatitis. One each of the following ART adverse events were reported: nevirapine-induced Stevens-Johnson syndrome, stavudine-induced lactic acidosis, stavudine-induced pancreatitis and lamivudine-induced red cell aplasia. Zidovudine-related anaemia occurred in 2 patients, and tenofovir-induced renal toxicity in 5. There was no significant association between groups and these adverse drug events or time to event. The median duration of follow-up was 6 months (interquartile range 4 - 6). The distribution of follow-up was the same in all three groups (Table 2). There was no significant difference between the ART groups with regard to incidence of TB IRIS, time to IRIS or number of admissions (Table 3). Patients in the immediate ART group were statistically more likely to die, and 47 of the 55 deaths (85.5%) came from this group, followed by the early and then the delayed ART groups (Fig. 1). There was also a significant difference in time to death between the three ART groups (p=0.003). Multivariable analysis was done to control for the confounding due to age, BMI, TB history, baseline renal impairment, baseline CD4 count, baseline Hb value, additional OI at ART initiation, definite versus probable TB, the site of TB (PTB/EPTB/PTB+EPTB), TB therapy drug susceptibility, inpatient compared with outpatient initiation of ART, use of traditional medicine before treatment, and concerns about adherence. The exposure was the effect of timing of ART initiation. Confounders that were not significant in the bivariate analysis were excluded from the model. After adjustment the early ART initiation group had a nonsignificant 1.1 times increased chance of dying compared with the immediate group (hazard ratio (HR) 1.1; 95% confidence interval (CI) 0.4 - 3.2; p=0.86). The delayed ART group had a 75% lower chance of dying compared with the immediate group, but this was not significant (HR 0.25; 95% CI 0.03 - 2.0; p=0.20). Factors that significantly decreased time to death were renal impairment and inpatient ART initiation. Those with a GFR of <60 ml/min were 2.5 times more likely to die than those with a GFR of >60 ml/min (HR 2.6; 95% CI 1.3 - 4.9; p=0.004). Patients initiated on ART as inpatients were 3.7 times more likely to die than those initiated as outpatients (HR 3.7; 95% CI 1.6 - 8.2; p=0.001). Confounders that significantly increased time to mortality were baseline Hb >10 g/dl (HR 0.2; 95% CI 0.1 - 0.6; p=0.003), EPTB compared with PTB (HR 0.3; 95% CI 0.1 - 0.7; p=0.005), and EPTB plus PTB compared with PTB only (HR 0.3, 95% CI 0.1 - 0.6; p=0.002). 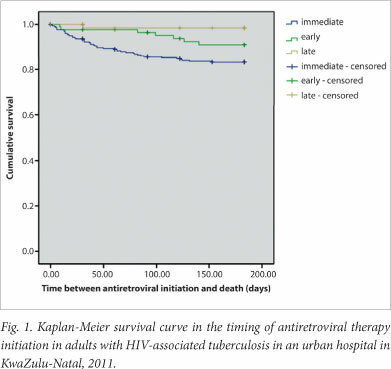 The study describes the clinical outcomes of PLHIV with HIV-associated TB treated in an urban hospital in KZN, based on the timing of ART initiation following TB therapy commencement. The three groups were similar demographically. The difference in BMI between groups is likely to be a type 1 error due to a large sample size in one group and low variability in all groups. Those who could not stand did not have baseline weights recorded, but were likely to have been underweight, leading to an overestimation of the baseline weight and BMI of the cohort. The immediate ART group was significantly sicker than the early and delayed groups as indicated by lower baseline CD4+ counts, GFR and Hb, and increased likelihood of having other OIs and inpatient ART initiation. They were also more likely to have probable TB and EPTB, diagnoses in keeping with paucibacillary disease, atypical presentations and increased EPTB consistent with the later stages of AIDS.11 Contrary to accepted knowledge and the CAMELIA study, patients with EPTB surprisingly had lower mortality.5,11 This finding needs further investigation. Immune reconstitution and VL suppression were achieved in all ART groups, in keeping with the CAMELIA, STRIDE and SAPiT studies.5-7 There were no significant differences in occurrence of adverse drug events between the groups. The incidence of IRIS in this study was 9.4%, which is lower than the 11% and 45% found in other studies.12 The incidence of IRIS was not significantly increased in the immediate ART group, as might be expected given the shorter interval between commencement of TB therapy and ART, lower CD4+ counts and increased EPTB.12 This may reflect the difficulty of diagnosing IRIS TB. A limitation of this study is the information bias due to underreporting of the outcomes of interest consistent with a retrospective chart review. Each patient was not followed up by the same clinician and the quality of the information recorded was not standardised. There were an additional 4 cases of drug-induced hepatitis in the cohort, but it is not clear from the patient records whether these cases were related to TB therapy or to ART. The generalisability of this study may be limited, as the hospital is semi-private and requires co-payments by patients. Further studies need to be conducted in this field to gather more information on optimal timing of initiation of ART following TB therapy and factors associated with increased mortality and survival. Discrepancies between studies also need to be investigated. Additional retrospective cohort studies may be useful to explore differences between a research population and a general clinic population. We thank the staff at McCord Hospital for their support and contributions to this research.